How far is it from 91 to 89? How far is from 91 to 89? Turns out a 4-putt ultimately kept me from breaking 90. There were other shots which didn’t help either but a 4 putt on a par 3 after hitting the green from the tee really, really hurts. I teed it up Ronnie, a co-worker and one of our customers this morning. 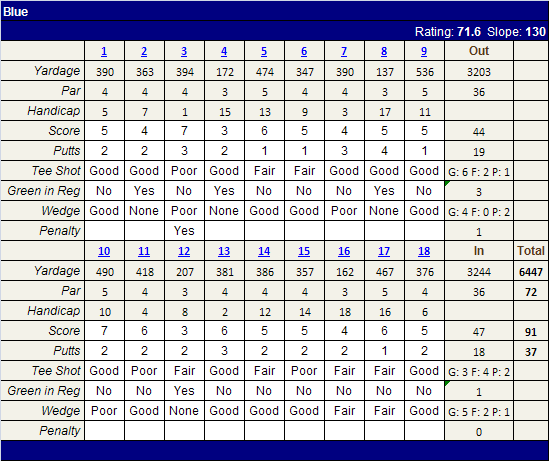 I played my best round in a long time – shot 91 and really hit the ball well. Ahhg, so close to breaking 90! I hit the ball well off the tee all day which makes a huge difference. I had a few other shots which were poorly executed which also could have gotten me under 90 but that 4 putt is what sticks in my brain. Last Friday Ronnie and I played 18 and were paired up another member and his old neighbor who happens to be a player on the local high school team and a scratch golfer. Nice kid and he can hit the ball a mile! I have played with a couple people who can really hit it but none were in the same league as this kid. Not sure what he shot but it was around par. After his drive on #18 he teed up another and tried to drive the green which is about 350 yards away. He was about 20 yards short! Of course, I played like crap. Started out okay but then I started pulling the ball left which I never do. I have struggled with a slice and if I get careless, it creeps back in. But a pull hook? Every once in a while but Friday I must have hit a dozen. Needless to say I was hitting from all sorts of odd places. My short game was ok and I putted well, no 3 putts at all. The highlight of my round was on #18 where once again I pulled my drive into the lake. From the drop area I hit a 3 hybrid to the fringe of the green and then hit a wedge in the hole for par! It may have been the best wedge shot I ever hit. It was a nice way to finish what was otherwise a terrible (101) round. Saturday I was hoping to get out and see if I could hit the ball a little better. I concluded that on Friday in an effort to hit the ball farther, I was swinging much too quickly (bad tempo) and hitting the ball poorly. My daughter (who is 8) and I played 9 holes late Saturday evening and although I didn’t score very well (50), I hit the ball much better and was much happier than I was on Friday. 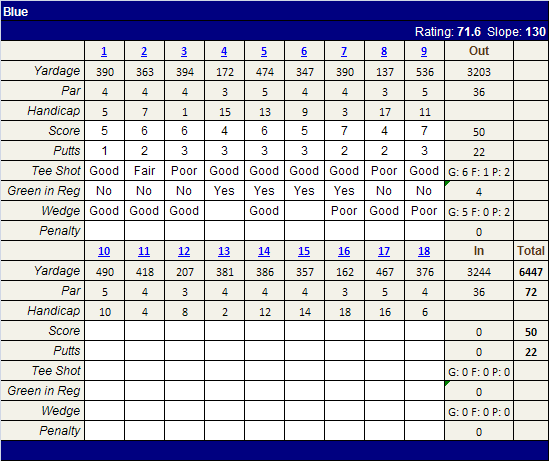 I didn’t putt well at all and some of that I attribute to making sure we weren’t holding up the group behind us.